﻿﻿﻿﻿﻿Giant redheaded centipede is one of Texas' most terrifying critters. ﻿﻿﻿﻿Many of us have a primal, involuntary aversion to “creepy-crawlies.” If that irrational fear is ever warranted, surely the giant redheaded centipede (Scolopendra heros) gives us justification for a healthy dose of chilopodophobia, a fear of centipedes. No doubt about it, as far as invertebrates go, the giant redheaded centipede is one bad dude. But what threat, if any, does it pose to humans? In the wild, these centipedes may reach 8 inches in length, and they can get even bigger in captivity. They have been recorded preying on invertebrates and even a variety of small vertebrates, including rodents, snakes, lizards and toads. Famously, their larger South American cousins have been recorded catching bats, and the giant redheaded centipede is capable of snatching flying insects out of the air, too. They use their legs to grasp prey while feeding, and their “fangs” (actually an additional pair of highly modified legs) are capable of piercing the skin and injecting a painful toxin. The walking legs also seem to be equipped with a venom delivery system, and are capable of piercing skin and causing pain and swelling. The caudal legs (the stinger-like appendages on the rear end) are prehensile, capable of grasping prey or pinching would-be predators. When aggravated, the centipedes usually flee, but may take a defensive posture, lifting the caudal legs in warning. Giant redheaded centipedes are usually found resting under logs, rocks or leaf litter, but they are often active during the day and occasionally enter houses, so encounters with humans are not infrequent. An account from the Civil War suggests that such encounters may indeed be horrific. 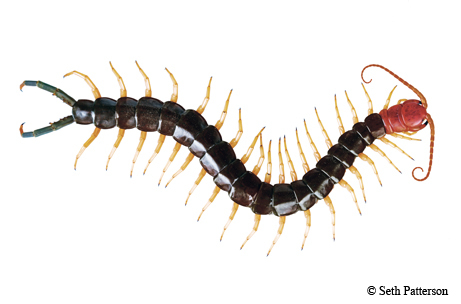 There’s an old legend that a soldier was awakened during the night after a centipede crawled over his chest. The animal left a track of red, painful punctures where it walked, resulting in two days of agony before the soldier finally died. Luckily, this story appears to be no more than a tall tale, and giant redheaded centipede bites have never resulted in a confirmed death. Bites are usually rather mild, resulting in a sharp, painful sting that is sometimes accompanied by swelling, usually subsiding after a few hours. In rarer cases, bites cause minor skin necrosis, dizziness, nausea and headaches. In only a few cases, bites have caused muscle tissue damage, kidney failure and heart attack. Consider centipede bites to be similar to bee stings: usually mild, but occasionally resulting in acute reactions. So, while caution is certainly warranted when dealing with the giant redheaded centipede, downright terror is probably an overreaction. As my entomology professor used to say, “It’s good to be big.” Relative to centipedes, we humans are big indeed, and even a giant centipede is no match for a shoe. But before going for the kill, the next time you come across one of these fearsome-looking critters, take a moment to appreciate an organism that is equipped, literally from head to tail, for hunting. Just be happy that it’s not the one wearing shoes — lots and lots and lots of shoes.